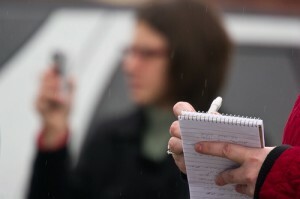 Are Journalism Schools Becoming Irrelevant? With the news that the University of Colorado may be shutting down its School of Journalism and Mass Communication, writer Jessica Corry argues that her alma mater -- and most journalism schools -- "probably never should have existed." Journalism isn't rocket science. You've got it or you don't, and when it comes to becoming a great reporter, students should spend their college years specializing in essential academic areas that will enable them to become experts on history, politics, culture, and economics. Or at minimum, they should focus on developing or adopting innovative approaches to distributing information through technology. In truth, America's post-journalism school world could hold government more accountable than the model it is replacing. At minimum, and with the aid of technology, it will transcribe the history of our local communities with more tenacity, authenticity, and transparency than ever before. She makes some interesting points. Here's another example of how technology is revolutionizing education. But with the progress of "citizen journalism," who will teach our budding reporters the critical skills necessary to analyze and dissect the information they Google? In a way, it's a skill everyone should know. One of the basic tenants of journalism -- how to weigh the validity of information based on its source -- is also one that makes us all, journalists or citizens, literate in the digital age.